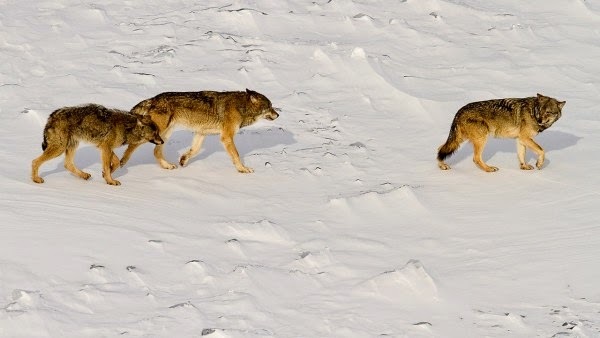 natural connections: The Wolves of Isle Royale and Michipicoten Island: "Very different trajectories..."
The Wolves of Isle Royale and Michipicoten Island: "Very different trajectories..."
Still jittery from the excitement of the day, I headed out of Ashland, WI, along the lake. A glimmer of twilight still lit the sky, and a bright planet hung above the road. The calm waters of Lake Superior reflected the heavens with a magical, luminous beauty. My imagination skittered out across the glassy surface, landed briefly on two almost mythical islands, and then back to the events of the day. Rolf O. Peterson had just concluded his keynote address at the Midwest Wolf Stewards Conference at Northland College. Hearing him speak for the first time was a thrill. I grew up without much of an interest in wolves, but Rolf changed all that. After reading his landmark book, “The Wolves of Isle Royale,” while preparing to teach winter plant identification for a wolf ecology course, I became captivated by the incredible stories and valuable knowledge generated by his long-term research project on Isle Royale. Wolves protect plants by controlling herbivores, he revealed. With that, I was hooked. The story still fascinates me. Moose swam the 15-20 mile expanse to Isle Royale in the early 1900s. With their hollow, buoyant hair, large paddle feet, and huge, warm, biomass, moose are excellent swimmers. Almost anything else needs wings, an ice bridge, or a boat to get to the island. For fifty years, the moose population boomed and busted in response to weather conditions and food abundance. Then, in the 1940s, wolves crossed an ice bridge and “introduced a new management plan,” joked Rolf. The wolves also initiated a new human interest in the island – research. Wildlife biologist Durward Allen worked for years to get funding and permission to research the newly arrived wolves. He finally succeeded in 1958, and pioneered the project. Rolf Peterson was his final graduate student. Through their efforts (and the many people who help them), we’ve all had access to the incredible drama unfolding on Isle Royale. As the numbers of both wolves and moose fluctuated widely over the years, our mythical beliefs of a system in balance were challenged. The wolf population on the island rose to the highest density ever recorded in nature, and then plummeted dizzyingly with the introduction of canine parvovirus. The moose population took off, while the wolves struggled, now handicapped by genetic anomalies caused by severe inbreeding. With the fluctuation in the numbers of charismatic megafauna came ups and downs for vegetation on the island, too. After the huge wolf crash due to parvovirus in the early 1980s, moose exploded and ravaged the trees. Rolf showed horrific photos of young balsam fir trees stripped bare up to their tips. But, as the wolves recovered, so did the trees. After a wolf from the mainland—M93, “the old grey guy”—brought new genetic fitness to the island wolves, the vegetation recovered even more. Rolf observed tens of millions of new trees sprouting on Isle Royale, and aquatic plants (a favorite food of moose,) returning to the lakes. While the wolf reintroduction in Yellowstone National Park (YNP) has put these carnivore-herbivore-vegetation “trophic cascades” in the news lately, the vegetative recovery in YNP is only along the lines of tens of thousands of trees. This winter, Rolf and his research staff found that the wolf population had decreased from nine wolves to only three, while moose had risen to 1,250. One of those three wolves has so many genetic anomalies from inbreeding, that Rolf suspects it may already be dead. Two new wolves came and explored the island for a few days, but traveled back to the mainland just a few days before the ice bridge melted. With the moose management that wolves brought to the island effectively gone, what might happen in the future? The moose are on track to double their numbers in a few years. The remaining mature balsam fir trees are nearing the end of their lives, with little hope for their seedlings to escape browsing. The National Park Service is conducting an Environmental Impact Statement for various management options, but that process may take years. As the future of wolves on Isle Royale seems to teeter at the brink, a thrilling new story is emerging on another island in Lake Superior. During the morning session at the Wolf Stewards Conference, Brent Patterson, of the Ontario Ministry of Natural Resources and Forestry, reported on three wolves who have just arrived on Michipicoten Island in northeastern Lake Superior. This little Provincial Park is the third largest island on Lake Superior, and sits about ten miles offshore. Caribou were reintroduced to the island in the 1980s, and they have been doing well. Last October, a kayaker unzipped his tent to find two wolves staring back at him. Later, tracks of three wolves were discovered walking down the beach. This February, Brent and others collared three very large wolves – an adult male and adult female, and a young female. Preliminary data show that these wolves are eating “high on the hog,” and are able to subsist on only the choicest bits of the many winter-starved caribou they take down. Researchers are on the edge of their seats, waiting to see if the adults will breed, how the caribou will fare, and what unforeseen events will result in more questions than answers. As the night deepened, stars twinkled to my north over Lake Superior...over the wolves. For the humans who have lived around this lake for thousands of years, it is a source of spiritual connection to nature. Native Americans, explorers, fur traders, sailors, and adventurers used it to foster connectivity across the landscape. For the wolves of Isle Royale, the Lake is now their prison bars, and a barrier to connection. What will the Lake mean to the wolves on Michipicoten Island? As long as we, as a society, continue to support and value research like this, we will soon be able to find out. For over 45 years, the Cable Natural History Museum has served to connect you to the Northwoods. Come visit us in Cable, WI! We are currently constructing our new exhibit: “Lake Alive!” which will open May 1, 2015. Find us on the web at www.cablemuseum.org to learn more about our exhibits and programs. Discover us on Facebook, or at our blogspot, http://cablemuseumnaturalconnections.blogspot.com. The last wolves of Isle Royale. Photo by Rolf Peterson.